Looking for a USED SH-5216A? Baileigh Industrial's SH-5216A sheet metal air shear is the perfect for any fabrication or HVAC shop where 16 gauge or lighter material needs to be sheared. 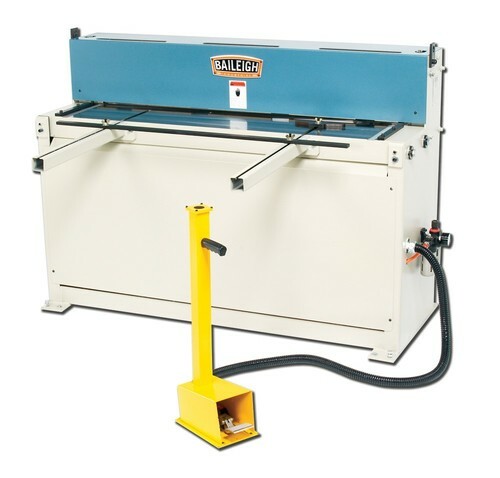 The SH-5216A air shear has a capacity of 16 gauge mild steel and will cut up to 52" wide sheet metal. The pneumatic system requires only compressed air between 90 and 115 psi and no electrical power to function. This powerful pneumatic shear can cut at speeds of 20 strokes per minute when high production is required. Baileigh Industrial offers tube and pipe benders, tube and pipe notchers, roll benders, band saws, sheet metal brakes, ironworkers, cold saws, press brakes and more. We are pleased to offer you quality metal working machinery and sheet metal equipment throughout Canada, Mexico and the United States, as well as Eastern and Western Europe. 315 ModelsView more about Baileigh Industrial, Inc. Looking to Purchase a New BAILEIGH SH-5216A?